Drain and rinse the almonds. Place the almonds, hemp seeds, and coconut water in a high-speed blender and blend on very high speed, for about 2 minutes until the almonds and hemp seeds are completely dissolved in the coconut water. I push the “whole juice” button on my blender twice. 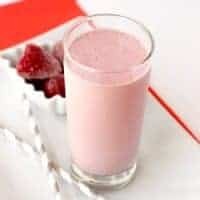 Add the strawberries, banana, and ice and blend until smooth and creamy.